Since most outside critters are taking a seasonal time-out, I’ve found inside furry friends to fill the void. This is Kitt, a friend’s cat. Kitt is a little different, special if you will. He fears little, loves to sit in front of the TV to watch the movie “Ice Age” and thinks people are his personal animated toys. 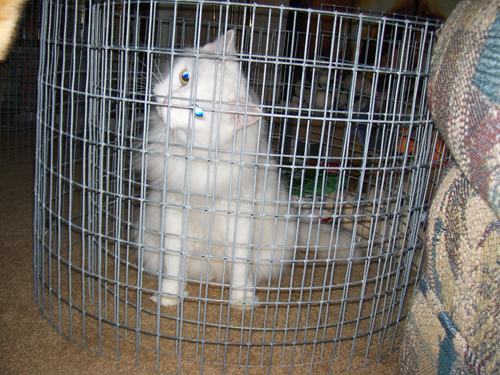 His mom was building rabbit cages, hence the roll of cage wire in the house. Kitt had to play the poor kitty card, so he hopped into the center of the roll and put on his best pitiful demeanor to gain some attention. It worked flawlessly. Very cute! And he’s gorgeous. He also thinks I’m an animated toy sent to his house just for his enjoyment (which is pretty close to the truth!) Thanks for visiting. That is just about the most disarming picture of a cat that I’ve ever seen. Boy, is Kitt playing to the gallery with that ‘pitiful-little-me-in-a-cage’ demeanour! I’d certainly be reduced to putty in his paws were he to pull that look on me! He’s a player. He plays all the angles to getting attention he can think of, but he’s such a hoot nobody minds. We just play along.